The Yellow-billed Amazon (Amazona collaria) is threatened by forest clearance for mining, agriculture and trapping for the wild bird trade. Project and progress: In collaboration with the American Bird Conservancy and the Kyle Brown Legacy WPT provided funding to study the distribution and population size of Jamaica's Amazon parrots in Cockpit County, including the Yellow-billed Amazon. Outcomes: Since 1995, there have been studies to determine the species' range, estimate population size, identify factors limiting reproduction and train local people in research methods and monitoring (Davis 1997, BirdLife Jamaica in litt. 1998). Some of its habitat has been designated a park but protection of those areas has been lacking (BirdLife Jamaica in litt. 1998). There is also an ongoing effort to prevent bauxite mining in Cockpit Country (S. Koenig in litt. 2007, 2009). Researchers have suggested further surveys and studies to determine range of the species are needed. 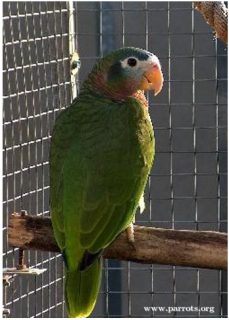 The BirdLife Jamaica Parrot Project advocates for introducing educational programmes and captive breeding. Where found: Jamaica, W Indies. History: The Yellow-billed Amazon, or Amazona collaria, is largely found in wet areas of Jamaica from Cockpit Country to Mount Diablo and in the John Crow Mountains (Juniper and Parr 1998). In habitat that it is suited for, such as that in Cockpit Country, it remains fairly common at a population of 5000 – 8000 pairs (Koenig 2001). However, in overall range and population it has suffered declines in the last part of the 20th century (Juniper and Parr 1998). Ecology: Yellow-billed Amazons are found up to 1200m (3936 ft) in wet limestone forest with Terminalia and Cedrela sp. foliage, more arid upland forest and cultivated areas with trees at forest edge. They forage for Cecropia catkins, nuts, fruits, figs and seeds. Birds are seen in large communal roosts outside the breeding season, and range widely during the day, returning to roost by dusk. Individuals may associate with Black-billed Amazons (Amazona agilis) and Olive-throated Conures (Aratinga nana). Groups employ sentinels on high, exposed perches to warn flock of danger.